Only one pool shape: When designing your pool it is important to know that your design may only contain one pool shape. If you require additional bodies of water in your design you may draw them in the Spa Stage. 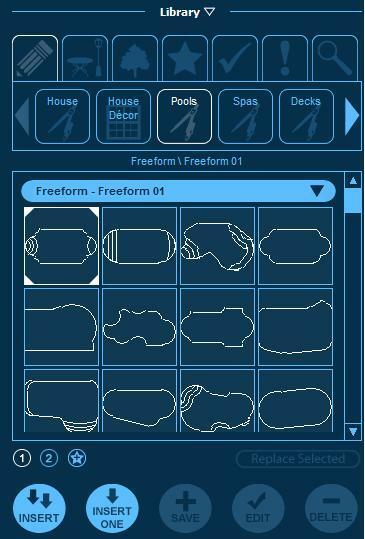 The program will only allow you to draw one pool shape. If you attempt to draw a second pool shape, the program will force you to start drawing from the last point of your first pool shape. While you will be able to draw additional segments and even appear to draw additional shapes, these segments will not change the shape of the pool or appear in 3D. If you have an incomplete pool shape the program will force you to draw from the last point of that incomplete shape. This allows you to complete your pool shape. 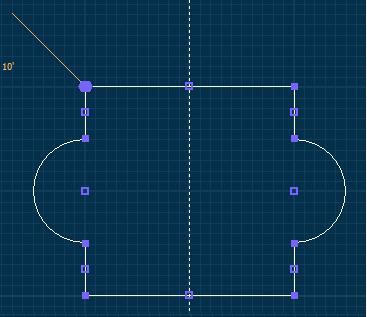 If you already have a pool shape in your design and insert a pool template from the library, the first pool shape will be deleted. Pool Water: The pool will not have water in it until you create the 3D presentation in Presentation Mode. This makes it easy to work on the interior of the pool. Pool Depth: The pool depth can be set in the Pool Depth Stage. Hide Outer Line: By default, the coping line of the pool is represented by an outer line around the pool shape. Check this box to hide this line in the 2D view and in Construction. Hide the Height Label: By default, the height of the pool is labeled. Check this box to hide this label in the 2D view and in Construction. 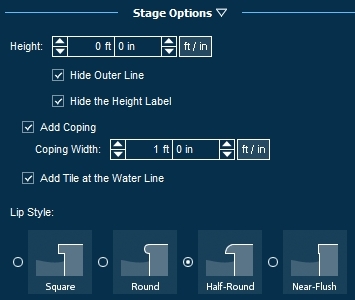 Add Coping: This checkbox allows you to add coping to the pool. Add Tile at the Water Line: This checkbox allows you to add a a tile line to the pool. The Library contains templates of previously drawn pool shapes. The templates are organized by Type under the Pools Category. Vendor pool templates are also located here. Select the pool template you wish to insert and either click the Insert One button or double left click on the image of the template. When you move your cursor to the viewport, the template will follow until you left-click to place the item. You can also save templates you have drawn for future use with the Save button.